Q: What style of music do you think most closely resembles your poetry? A: I always write with music in the background. I’m either listening to hip hop or electronic dance music and I think those styles find their way to the page as well as influencing the way I perform my poems out loud. For my beat box poems, definitely hip hop. Q: Did you choose your writing style or did it choose you? What does your style allow you to do with your poetry that other styles would not? A: The style chose me. I would say my writing process involves more feeling than thinking. I try to live the content in the process of writing. I try to feel the beat and then I start writing and see where it takes me! Q: How do you choose what a poem will look like on the page? A: I want to think of the page as a piece of technology that captures the way I would read the poem out loud. The page is a musical score. I’ve noticed that people will read poems out loud in many different ways. Some people zip through the end of the line without a pause, some ignoring commas and punctuation, others pausing for a split second at the end of each line. Every poem I write looks different on the page, but I try to think of space the same way a musician would approach half rests or whole rests. I set out to format the poem while also thinking about tempo. For my beat box poems, I made up my own notation; indicators that emphasize which phoenetic combination will serve as a sound in beat box. Q: How do you choose your punctuation or lack thereof? Does it have more to do with grammar, visual cues, or auditory/musical cues? A: My choice to leave out punctuation is about auditory and musical cues. I will read my poem out loud differently than a reader who reads my poem out loud. Yet, I hope that using space, instead of punctuation, will at least force the reader to either visually pause or audibly pause at moments where it is necessary. Q: Do you think that punctuation can be equated with musical notation symbols such as note value, rests, and dynamic markings? How do you think of white space? Between words and stanzas? As it relates to the size and shape of the paper your work is printed on? A: Yes. I think using space is more effective in delivering musicality than punctuation. I studied music before I found my passion for poetry. I find that poetic craft terminologies are interchangeable with music terminology. The trickiest aspect though is how does the poet notate tempo on the page? Q: Do you think your poetry gives visual auditory cues to the reader? Do you think the reader hears the way you read your poetry by sight alone? If not, what do you think impedes this transfer of information? A: I think the way I use white space and the way I format my poems on the page serve as auditory cues for the reader. I think that the page can successfully capture voice and tone but there is nothing like hearing a poet perform their poem out loud. Douglas Kearney is the poet I admire who successfully notates his performances to the page. It is one experience reading his poems from the page and another hearing him perform in person (or via video / audio). Q: How do you notate your poetry to make up for the lack of your voice being there? Do you try? A: I try to format my lines, my line breaks, even the font of the words to represent the way I would read it out loud. Q: Do you consider yourself a performer of your poetry, or a reader? How come? A: I consider myself a performer. I love reading out loud and I love participating in theatre and music projects. I try to capture all of my artistic interests in one. Q: How would you describe your performance/reading style? Do you think that popular reading styles have shaped the way you read, or have you actively worked against the pull of mainstream performance style? A: I consider my work as performance poetry rather than slam. I think there is a specific rhythm and tone that comes out of me when I am capturing emotion or empathy that is my own voice. Q: Do you think you’re the best performer/reader of your own work? A: Yes, I think I am the best performer of my own work. My poems are an extension of my emotional limbs and I feel as if I can deliver the same tone and feeling that was present in my process of writing the poem. Heather A Warren is a poet and musician from Fairbanks, Alaska. Her poetry can be found in journals such as Pilot Light; Narrative Northeast and Skin 2 Skin. She is the beat boxer for the Alaskan Psych Folk band HARM where her poetry can be found in song form. 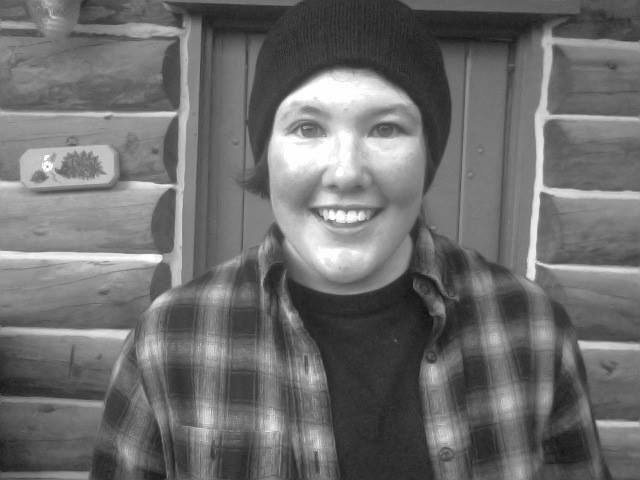 Heather holds a MFA in Creative Writing poetry from the University of Alaska Fairbanks.